A quick, colorful summer side for a barbeque! It travels well to picnics—and the ingredients travel well to a vacation rental. 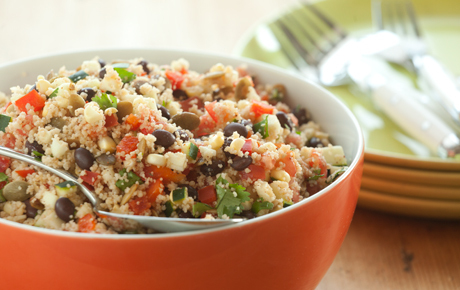 For a gluten-free version, use cooked quinoa in place of preparing the couscous. Bring 1 1/2 cups water to a boil in a medium saucepan. Stir in couscous, cover and remove from heat. Let stand 5 minutes; fluff with a fork. Toss couscous with remaining ingredients in a large bowl.